I am in no way belittling the role, the magic, the absolute necessity of a decent suit. But never underestimate the importance of a good shoe. Shoes are not just the icing on the cake. They are an essential ingredient. And the wrong ones will destroy all your tailor’s hard work. Do not think the same pair of brown brogues made in Northampton in 1998 will suffice for everything. Yes, you are very proud of them, they cost a lot of money, they were made in the traditional way from the finest leather by a time served craftsman… But face it, they are twenty years old and they look more worn in than you do. 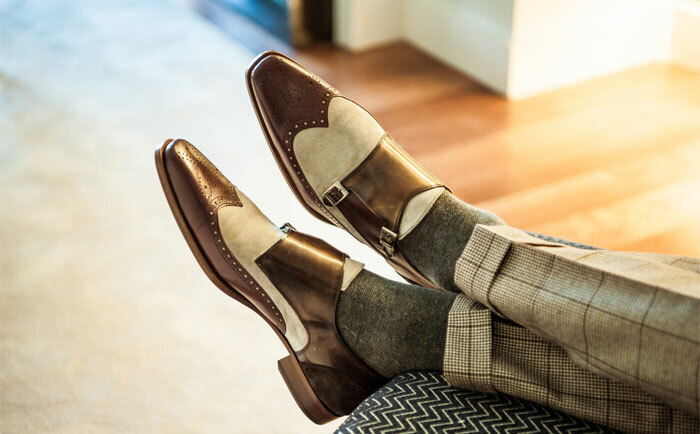 In the interests of preserving your investment in sartorial elegance from the ankles up, N&T has partnered with UNDANDY, a particularly fantastic Portuguese custom shoemaker. Founded in 2015 by two entrepreneurs with the aim of preserving traditional shoemaking and craftsmanship via modern technology, www.undandy.com features an easy to use 3D designer that guides you through a choice of hundreds of materials, styles and finishes toward your ultimate custom-made shoe. Like N&T, Undandy are all about attention to detail and even offer an engraving on the soles. Your unique design will be handcrafted at their Portuguese workshop and delivered from the workshop floor and your cobbler’s hands to your front door. Step this way (!) for hand-made custom shoes from only £160. And take 10% discount with our special code “Norton&TownsendxUndandy”.